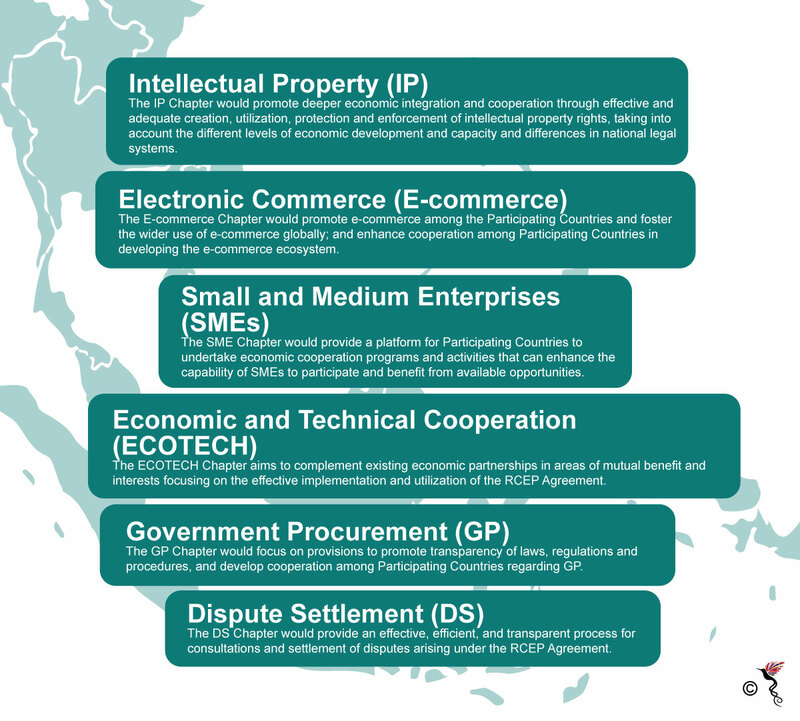 The Regional Comprehensive Economic Partnership (RCEP) encompasses 25 percent global GDP, 45 percent of the total population, 30 percent of global income and 30 percent global trade. Led by the Association of Southeast Asian Nations (ASEAN), it is one of the most useful strategic opportunities for the 16 countries – ASEAN-10, India, China, Japan, South Korea, Australia and New Zealand – to realise an economically open and liberal Asia Pacific. 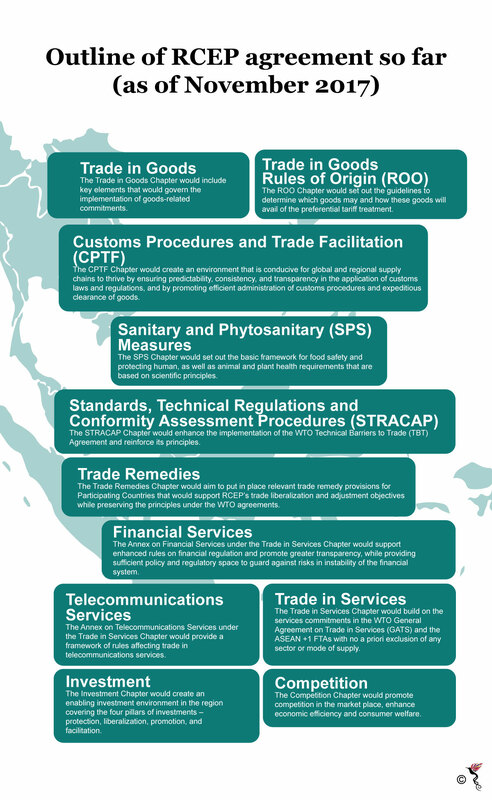 The potential that RCEP has is immense. If it is completed, it stands to be the largest trade and investment agreement since the General Agreements on Tariffs and Trade (GATT) Uruguay Round in 1994 which established the World Trade Organisation (WTO). However, completing the trade deal is a mammoth task. The paper rightly indicates that RCEP economies come from “different starting points” – the wealthiest RCEP economy (Australia) being 48 times richer than the poorest (Cambodia). Besides that, the largest RCEP members do not have Free Trade Agreements (FTAs) with each other – India-China, Japan-China and Japan-Korea – and that their bilateral baggage often hampers RCEP negotiations. Moreover, protectionist economic attitudes is a huge stumbling block to the completion of negotiations. India, for example is being pressured to liberalise tariff lines from 80 percent to 90-92 percent. However, New Delhi has been wary of such measures – that it might cause cheaper Chinese goods to flood its markets and hurt its manufacturing industry. As of now, 20 rounds of negotiations have been completed and the 16 nations are slowly inching towards a deal agreeable to all. Speaking at a lecture on Singapore’s priorities as ASEAN Chairman in 2018 at the ISEAS – Yusof Ishak Institute in early December, Singaporean Foreign Minister, Vivien Balakrishnan expressed his hope that a ‘high quality RCEP” would be completed by the end of next year. “Do I hope that all the homework that ASEAN had set for itself, not just from our Chairmanship, but from earlier Chairmanships, is also settled by December? I think we can make progress on all that,” he added. Balakrishnan was referring to the Trans-Pacific Agreement (TPP) which is being concurrently negotiated as the Comprehensive and Progressive Agreement for Trans-Pacific Partnership (CPTPP). The TPP which was dealt a blow when the United States reversed its commitment to the pact upon President Donald Trump’s elections, has continued to trudge along – with Japan leading negotiations among the remainder 11 economies. In pursuit of the goals of the ‘pathways’ to a Free Trade Area of the Asia-Pacific (FTAAP) however, RCEP seems like the better bet than the TPP. In the same briefing paper, the authors agreed that US withdrawal of the TPP has made RCEP” the most inclusive pathway” towards achieving FTAAP. “The US withdrawal will likely make the TPP agreement, even if it is ratified, a less attractive pathway for regional countries, particularly large ones like China and India. India and China have expressed the view that the TPP agreement is too ambitious for either to join at their current level of development. RCEP, given the predominance of lower and middle-income parties, is less ambitious and more sensitive to these concerns,” Cook and Das wrote. But this does not mean that the RCEP and CPTPP are in competition with each other. Such a juxtaposition may have arisen due to the exclusion of China in the TPP and its inclusion in RCEP. “Whether you call it RCEP or TPP, to me these are all multiple avenues that lead to an architecture, an inclusive, open, integrated, interdependent architecture – that can achieve peace and prosperity for all of us. And that’s something well worth working towards,” Balakrishnan reiterated.